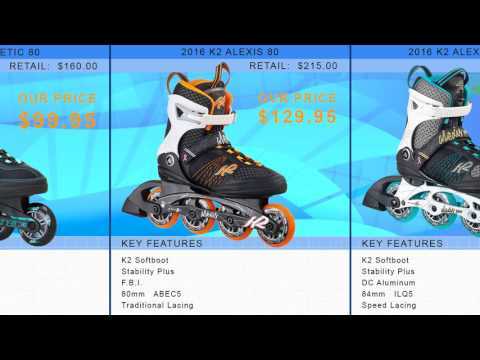 The K2 Alexis Pro 84 inline skates offer great performance and comfort for those looking for a fitness skate to take their skating to the next level. Great for taking on some light training or for skating up to the local ice cream shop, the Alexis Pro 84 is great for many skaters. From head to toe the K2 Alexis Pro 84 women's inline skates have it figured out. When you initially slide on the Alexis Pro 84's you will be hit with some softness and support thanks to the K2 Softboot Design and stability plus cuff. This mix gives you immense comfort from the Softboot and the ability to push off with great control thanks to the hard plastic stability cuff. Also, to ensure that your new skates don't get stinky there is an antimicrobial footbed included in the skate. Underneath the comfortable boot you have the 84mm wheels paired with the ILQ-5 bearings which will roll smooth and easy even over slight imperfections in the skating surface. The 84mm wheels are large enough to roll smooth over rough patches but aren't so big that you will feel out of control. To make sure you get the most out of each stride the K2 Alexis Pro 84 comes with the D.C. aluminum frame that works to offer a great power transfer so you can get your monies worth out of each stride. As you can see the K2 Alexis Pro 84 has a lot going for it including comfort, performance and ease of use. Whether you're looking for a skate to take your fitness to the next level or looking for a skate to get around the neighborhood, the K2 Alexis Pro 84 is right for you. Great skate but definitely too small. I am a true 9 and the fit was a solid 8. I had to return for a size 10. K2s okay for the occasional skate..
Q: Hi, I am looking to teach my 12 year old sister to skate, and like the look of these. The only thing I don't like is the 84mm wheels; I think of 80mm as more of a beginner size. Two questions: 1.) What wheel size do you recommend for beginners? 2.) Would it be possible to put 80mm wheels on these skates? Thanks. A: You can put 80mm wheels on this skate with no issue, then you could have the 84mm in the bag for when the skater is ready to progress to them. It's really a can of worms as far as what wheel size to start someone on as it really depends on how athletic the skater is, if someone is fairly athletic and take to sports quickly the 84mm wheels are not going to be a big deal at all. If the person has good natural balance this is another good qualifier that wheel size isn't going to be that large of a factor. Between 80mm and 84mm the difference is obviously only 4mm which in the grand scheme of things isn't much. Start them out on a level smooth surface and you'll be good, you can also use a hockey stick for balance in the beginning. Q: Would you recommend these over the K2 Alexis Boa Women's In-line skate? They are listed as the same price as of now but these have higher ventilation which is important for me because I'm planning on using them regularly in very warm weather—but the Boas are a later model and have the boa lacing system. Which would you recommend? A: It really comes down to choosing the lace system as that is the main difference in the skates. I see the breathability is listed different for the skates but these are the same boots so that appears to be a mistake, and both skates will offer great breathability. I skate with the men's version of this skate and have never had an issue. The main difference in the skates is the BOA lacing versus quicklace, both are great but BOA is going to be a bit faster. 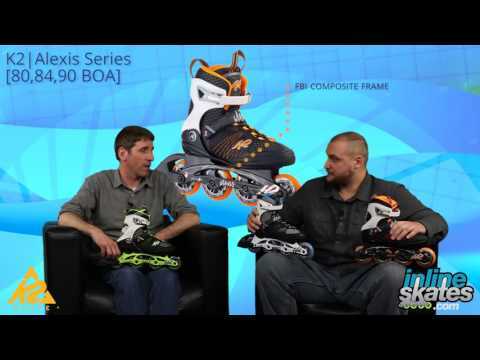 The BOA version also has a slightly larger frame giving you the ability to upgrade to 90mm wheels if you want to, the non BOA skate doesn't offer this as it maxes out at 84mm. Both are great skates, pick based on your preference and what is most important to you in skate feature. Q: How do skate sizes compare to reg shoe size? A: Most all recreational and fitness skates are going to fit the same as your daily shoe size. I wear both K2 and Rollerblade skates and take both in my daily shoe size. Skates can take a few sessions to break in and may feel tight right out of the box but also keep in mind that a proper fit in skates is a snug fit. Q: Will these skates accommodate a larger wheel size? Q: if is it possible to use them without back brake? A: The brake is removable but you will need an additional short axle not included with the skates. Call customer service to look into ordering the additional axle. Q: The description says true to size. I am a size 7.5 and ordered the 7.5. My toe is constantly up against the top of the boot. The width feels fine. Should there be space between the big toe and top of the boot? I'm wondering if I should exchange for a size 8? A: It sounds like you have a perfect fit, but for some a perfect fit can feel kinda claustrophobic to the foot. inline skates are to be fit similar to ski boots where you should have little to no room, as long as your toes are not curled or crunched at the front and are just touching the fit should be good to go. When you bend at the knee and put yourself in a skating position you should feel your toes come back a bit giving you a little more room. Skates are also going to break in and will fit much better after a few times skating. I personally wouldn't advise going to a larger size unless your toes are curled or crunched, but the end decision is up to you based on how the fit feels. Q: Can the heel brake on the back be removed easily? A: Sure can, Jenny, you daredevil you. The brake can easily be removed but you will need to order an additional short axle since the last axle on the skate that holds the brake is longer than the rest and when removed there will be excess axle blowing in the wind. The axle is not expensive, I'd recommend chatting it up with one of our coffee laden customer service enthusiasts at 888-421-6836 and they can order you an axle when you place the order for your skates. A: K2 skates are going to fit about the same as your shoe size so she probably would be better off in the size 8.5 as this seems to be her proper size. This is a past season skate so is discounted but is not available in all sizes. We do have this skate available in a current year model in the proper size. She could most likely wear the size 9 without issue but if she skates a lot in them and they are too big she will get sore feet/blisters.